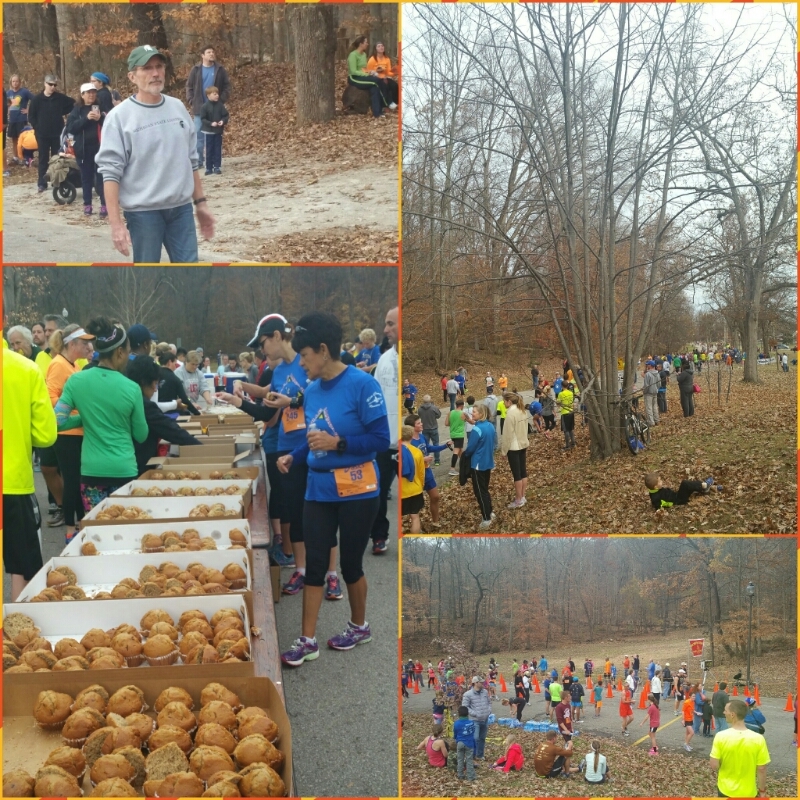 Thanksgiving was one of the warmest I’ve experienced while living in Louisville at the 36th Annual Thanksgiving Day Run sponsored by Iroquois Hill Runners and Swags Sports Shoes. 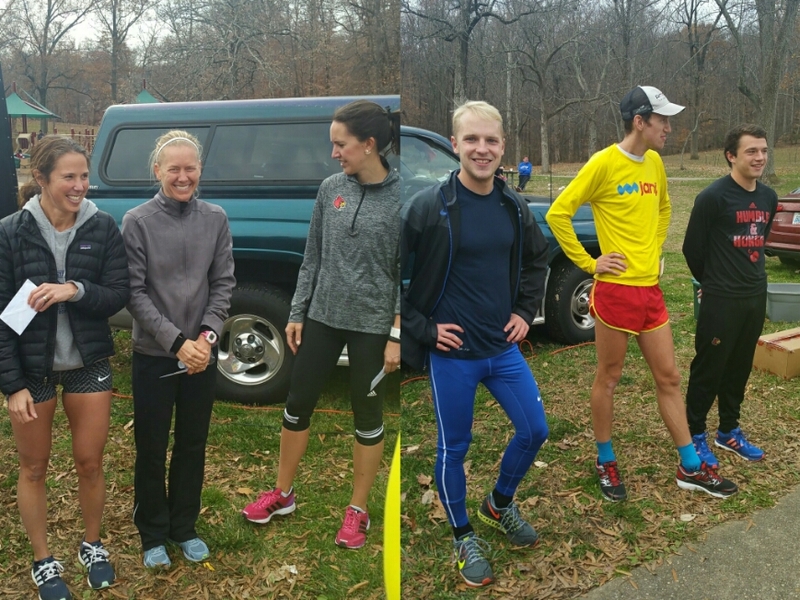 I could tell that this event is a tradition in Louisville’s running community based off the number of people with technical shirts from previous years. This must of also been the throwback running shirt day because I saw some Triple Crown shirts going back 10+ years. The Thanksgiving Day runners meant business not only because we wanted to earn our feasts later in the day, but due to cash being on the line. Iroquois Hill Runners were offering $150, $100, and $50 to the overall finishers for male and female and $20, $15, and $10 for age groups 5 deep. I knew I was out of the top 3 overall, because there are some speedy runners whose names I am familiar with in the Bluegrass. That didn’t mean I couldn’t pipe it up for an age group award. I was running the 5 mile race for prizes and C entered the 1.25 mile fun run/walk. 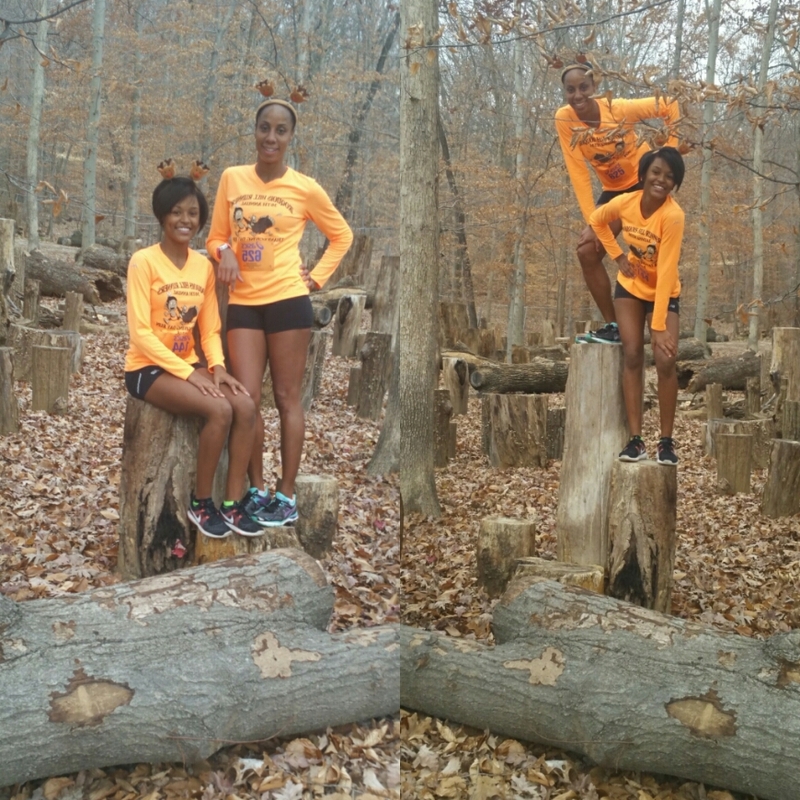 The longest she has trained with me is 3 miles, so she was not ready for a hilly 5 miles. She was concerned over the route and I told her to follow the signs and the crowds. The problem was that we did not see anything to differentiate between the two distances. C said she would run with me and pretty much dusted me with her natural sprinting ability. I knew she would tire out and that occurred as soon as we hit the incline. Amazingly, I coasted up to the scenic overlook without any problems. The actual overlook is closed due to reconstruction. The 5 mile route took me through a part of Iroquois Park that I have never seen. I would normal run to the top and back down. I don’t know where this extra road came from, but I’m aware of it now. The second half of the race was downhill and flat. I complimented this young lady on her pretty, purple running set. Around that time, I spotted C walking with a classmate. I knew they went way beyond 1.25 miles. Finally, we hit the flat and I knew the finish line was near. Ms. Purple came out of no where for a strong finish. It was great to see so many youth being active on a holiday. C was about 15 minutes behind me. Her friend lost his challenge of crossing the finish before she did. Why is it when someone gets dusted they say “You cheated!” Nah brah, you got beat by a girl! It was all love. He actually stopped running and I had to tell him to finish. IHR and Swags had the treats laid out! There was so much food and a lot of gu, vitamin and power bar samples, along with several beverage options. 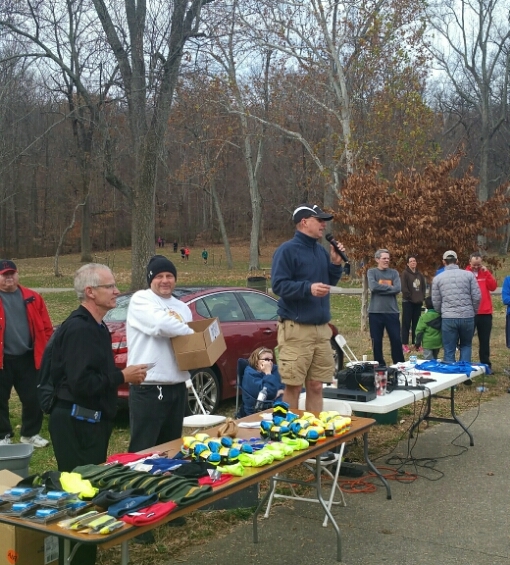 The entire table of running gear was raffled off along with several $100 gift certificates for shoes and a $500 grand prize. Socks and gloves were generously tossed into the crowds. The overall female and male winners were announced. On the men’s side were two collegiate athletes who were unable to accept the cash prizes. 2nd place overall was Michael Eaton, whose blog I follow as he pursues Olympic dreams. This is the caliber of runners that this race draws. Never one to miss a photo opt, here are some of our Thanksgiving Day memories to go down in our life books! Official times were posted and guess what? I won a free tank of gas! Yeah buddy, that $20 is going on gas 🙂 One last note, the race shirts were genius. Loud color for safer fall/winter running. 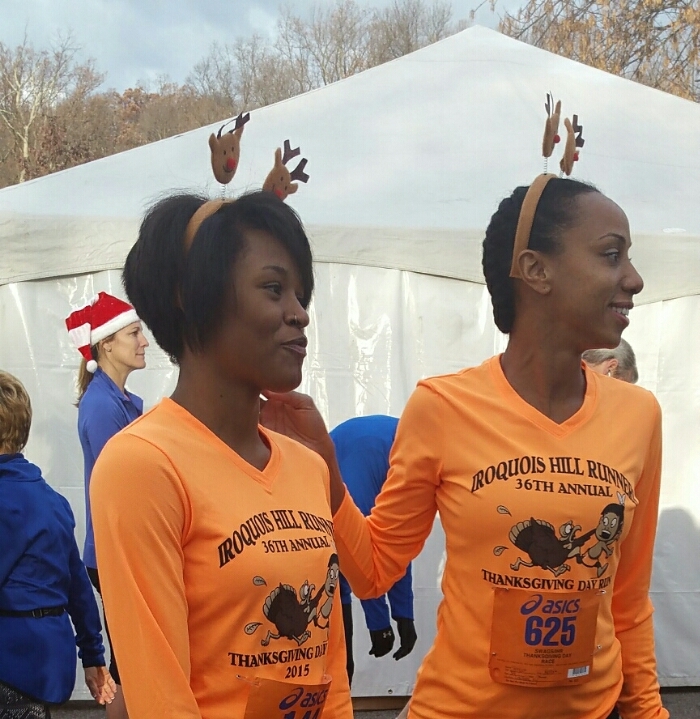 This entry was posted in family, fitness, health, Louisville, running and tagged Iroquois Hill Runners, Swags. Bookmark the permalink. The race turned out well. Congratulations on the tank of gas. Ladies Prism is coming soon to romance the world. Scotian Breeze is the movement, and Treasure Words, Collect Figures is the company. History in the making; stay tuned. Keep us posted on the movement! As always you did amazing. I wasn’t able to do my 5 miler this year. But I went out and cheered for those who did. You continue to step it up. Go girl! Glad you had an enjoyable Thanksgiving!! Do you want to walk the new Abraham Lincoln bridge Saturday? Cool! This will be fun Yayyyy! You forgot about that delicious Thanksgiving Dinner you had later that day. That delicious dinner had me running in bipolar weather all weekend to burn it off!